Infectious diseases frequently occur in the neonatal intensive care unit (NICU). Because of the close correlation between better outcomes and prompt treatment, effective methods for assessment of illness severity should be established . For this purpose, several scoring systems, including the score for the neonatal acute physiology-perinatal extension II (SNAPPE-II), has been developed specifically to quantify neonatal illness severity in the NICU population . As an empirically-validated illness severity and mortality risk score, SNAPPE-II has been shown to have good calibration and discrimination values [2, 3]. It is intuitive clinically that the higher the SNAPPE-II, the sicker the neonate, but the data which are needed for the calculation of SNAPPE-II are difficult to be collected completely . Some laboratory tests, such as interleukin-6 (IL-6) and procalcitonin (PCT), are also used to support the diagnosis and determine the severity of neonatal sepsis [5, 6]. IL-6 is an important cytokine of the early host response to infections. IL-6 increased rapidly in patients exposed to bacterial endotoxin and falls precipitously following effective treatment, thus IL-6 is used as an early and sensitive marker of neonatal sepsis [5, 7]. PCT is mainly produced by monocytes and hepatocytes, and the concentration of PCT began to rise within 4 hours after the patients' expososure to bacterial endotoxin, and peaked at 6-8 hours and decreased to normal levels after receiving effective treatment within 24 hours . PCT was once considered as a more promising septic marker than other markers, while recent studies have provided conflicting results, especially in critical care settings [6, 8, 9]. Bone is a complex organ with multiple functions , such as regulating hematogenesis , affecting immune function , and influencing energy metabolism [13, 14]. Bone is mainly composed of osteoblasts (OBs) and osteoclasts (OCLs). Bone alkaline phosphatase (BALP), as the specific functional marker of OBs, is released into the circulation after being produced by OBs, and serum BALP levels can be used to evaluate the activity of OBs. Moreover, absence of significant circadian variations is a salient feature of BALP [15, 16]. Osteocalcin (OC) is another biomarker of bone, which is mainly synthesized by OBs. After being produced, the majority of OC is incorporated into bone matrix, and is released into circulation during bone resorption [17, 18]. Carboxy-terminal peptide of type I collagen (CTX) is the short fragment at C-terminal domain of typeⅠcollagen molecule, which is cleaved by OCLs and released into the circulation during bone resorption, thus it is considered to be a specific functional marker of OCLs . Previous studies in mice revealed that some stress situations, such as bleeding and inflammation, could affect the activities of OBs and OCLs . Several clinical studies also found that inflammation could influence the functions of OBs and OCLs in adults and children [21-23]. Therefore, we hypothesized that bone metabolism biomarkers can reflect the illness severity of infected neonates. To test this hypothesis, we investigated the relationships between serum BALP, OC, CTX, IL-6, and PCT levels, and SNAPPE-II in infected neonates and in non-infected neonates, and in the infected neonates before and after receiving treatment. Study design: In this study, we assessed the neonatal illness severity by measuring SNAPPE-II, serum levels of IL-6 and PCT, and evaluated the changes in bone metabolism by measuring serum concentrations of BALP, OC and CTX, respectively. In addition, serum levels of PTH, 25-(OH)VD, two key molecules regulating bone metabolism, were also measured. By comparing the levels of BALP, OC, CTX, SNAPPE-II, IL-6, PTH, 25-(OH)VD and PCT among the neonates in the infected group and non-infected group, we tried to explore the relationships among these parameters in the neonates with or without infection, as well as before and after treatment. Study population: In this study, we observed a total number of 685 neonates admitted to NICU of the Pediatric Department of the Daping Hospital between August 2009 and March 2010. Among these infants, we included 104 neonates in the study and informed consent was obtained from the parents. The study was approved by the Ethics Committee of the Third Military Medical University. Sixty-three neonates enrolled in thie study were classified into the infected group (n = 33) and non-infected group (n = 30) according to the criteria below, the procedure is shown in Figure 1. Inclusion criteria: The inclusion criteria were as follows: (1) term infant; (2) between 3 and 28 days old; (3) confirmed sepsis, severe skin infection, or pneumonia; and (4) no suspected muscular, neurologic, or bone diseases. Exclusion criteria: The exclusion criteria were as follows: (1) family history of bone diseases; (2) severe pathologic jaundice; (3) received steroid therapy; and (4) maternal smoking. The infected group consisted of 33 neonates with sepsis, severe skin infections, and pneumonia. Sepsis was defined by a positive blood culture and at least one clinical sign or symptom from each of at least three of the following six categories: (1) heart rate > 180 beats per minute or < 80 beats per minute or arterial blood pressure (BP) below 2SD of the mean BP; (2) metabolic acidosis with a pH < 7.25 or poor peripheral perfusion; (3) respiratory distress or respiratory rate > 60 per minute or respiratory pause lasting > 10 seconds; (4) abdominal distension and/or feeding intolerance; (5) central temperature > 37.5℃ lasting at least 4 hours; and (6) lethargy or convulsions. A diagnosis of pneumonia should meet all of the following criteria : (1) negative blood culture; (2) radiographic evidence of pneumonia; (3) respiratory signs or symptoms; and (4) white blood cell count > 25.0×103/mm3 or < 5.0×103/mm3 or elevated immature/ total neutrophils (I/T) ratio > 0.20. Skin infections consist of cellulitis (n = 1) and pustulosis (n = 2), which were mainly defined by symptoms including skin color, skin temperature and the features of rash or erythema. The non-infected group included neonates with asphyxia neonatorum (n = 18), glycopenia (n = 7), and physiologic jaundice (n = 5); they had no clinical and laboratory evidence of infection at the time of sampling. Laboratory tests: The data of all neonates were collected for calculating SNAPPE-II, and blood samples (about 1 ml) were obtained within 24 hours after admission to the NICU. The whole blood count was performed immediately by using an automated counter. Serum was isolated within 30 min and preserved at -100℃ before analysis. These measurements were repeated every 72 hours or when the clinical conditions took a bad or a favorable turn and after complete recovery. The serum concentrations of BALP, CTX, OC, PTH, 25-(OH)VD, IL-6 and PCT were compared with those of the initial assay. BALP was measured by an electrochemiluminescence immunoassay (ECL) with a Unicel DXI-800 analyzer (Beckman Coulter Inc., Fullerton, CA, USA) using the Access Ostase kit (Beckman Coulter Inc., Chaska, USA); the detection range was 0.2-120 μg/L. CTX was also measured by ECL with an Elecsys 2010 (Roche Diagnostics, Mannheim, Germany) using the Elecsys-CrossLaps/serum kit (Roche Diagnostics); the detection range was 0.01-6.0 μg/L. N-terminal midfragment of OC (N-MID) was measured by an enzyme linked immunosorbent assay (ELISA) according to the manufacturer's instructions (Immunodiagnostic Systems, Boldon, UK); the detection range was 0.5-100 μg/L . PTH was measured by ECL with an Elecsys 2010 (Roche Diagnostics, Mannheim, Germany) using the Elecsys-CrossLaps/serum kit (Roche Diagnostics); the detection range was 1-3500 ng/L. 25-(OH)VD was measured by ELISA according to the manufacturer's instructions (Immunodiagnostic Systems, Boldon, UK); the detection range was 47.7-144 nmol/L . IL-6 was measured by an ELISA kit according to the manufacturer's instructions (Dakewe Biotic, Beijing, China); the detection range was 6.25-200 μg/L . PCT was determined by an ELISA kit according to the manufacturer's instructions (R&D Systems, Minneapolis, MN, USA); the detection range was 0.3-10 μg/L. Statistical analysis: Statistical analyses were performed with SPSS 13.0, a two-sided significance level of ≤ 0.05 was considered statistically significant. Descriptive statistics were presented as the mean, median, standard deviation (SD), maximum, and minimum. We used the t-test or Mann-Whitney U test for between-group comparisons according to normal or non-normal distribution of data, as appropriate. Within the infected group, we compared the values with baseline by a Wilcoxon signed-rank test. Correlations between quantitative data were analyzed by Spearman's correlation test. In this study, a total of 63 term neonates were enrolled (33 and 30 neonates were classified into the infected and non-infected group, respectively). While recording the clinical alterations intensively, we collected blood samples within 24 hours after admission to the NICU and repeated the sampling every 72 hours thereafter. A total of 161 blood samples were obtained; the clinical characteristics of all infected neonates in this study are summarized in Table 1. Demographics and clinical characteristics of the study infants. †: represents p < 0.05 compared with infected group. §: represents p < 0.01 compared with infected group. In this study, the length of hospitalization of the infected and non-infected group was 9.27 ± 1.86 and 7.70 ± 2.17 days, respectively. There were no significant differences between the two groups with respect to the genders, gestational age, and body weight at birth. We found a significantly higher incidence of hypoxia, apnea, and feeding intolerance in the infected group than in the non-infected group, as shown in Table 1, and the data of neonates with infection are shown in Table 2, although the mean leukocyte counts in the infected group were higher than that in the non-infected group (13.31 ± 5.16 vs. 12.97 ± 4.79 ×109 /L; p > 0.05). We compared PTH, 25-(OH)VD, BALP, OC, CTX, SNAPPE-II, PCT, and IL-6 levels between the infected and non-infected groups before effective treatment. We found that BALP was significantly lower in the infected group than in the non-infected group (50.02 ± 15.39 vs. 64.07 ± 17.44 μg/L, p < 0.001). We also showed that the SNAPPE-II and IL-6 levels were higher in the infected group (23.6 ± 21.4 vs. 19.9 ± 14.3, p < 0.01; 37.45 ± 17.84 vs. 25.55 ± 8.77 ng/L, p < 0.001, respectively). There were no significant difference in the PTH, 25-(OH)VD, CTX, OC and PCT levels between the two groups before treatment (30.87±13.03 vs. 31.23±12.75 ng/L, p > 0.05; 181.86±53.38 vs. 186.49±57.65 nmol/L, p > 0.05; 1.38 ± 0.39 vs. 1.35 ± 0.33 μg/L, p > 0.05; 23.10±5.53 vs. 23.49±6.69 μg/L, p > 0.05; 3.54 ± 1.23 vs. 4.28 ± 1.29 mg/L, P > 0.05, respectively), as shown in Table 3. We also compared these markers among the neonates before and after receiving effective treatments, and found a noticeable increase in the BALP concentration in the infected neonates after treatment (63.58 ± 19.63 vs. 50.02 ± 15.39 μg/L, p<0.001). A significant decrease in SNAPPE-II and IL-6 levels was also observed (13.7 ±15.9 vs. 23.6 ± 21.4, p < 0.01; 25.93 ± 7.98 vs. 37.45 ± 17.84μg/L, p < 0.001, respectively). There was a significant inverse correlation between BALP and SNAPPE-Ⅱ before and after treatment (r = -0.56, p= 0.025; r = -0.37, p = 0.04, respectively). The changes in BALP and IL-6 levels among the infected neonates before and after effective treatments are presented in Figure 2. 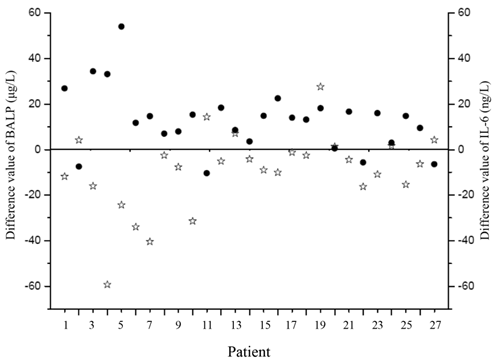 Furthermore, the value difference between BALP levels before and after effective treatments was noted to be inversely correlated with the value difference of IL-6 (r = -0.65, p< 0.01), as shown in Figure 3. We also measured PTH, 25-(OH)VD, OC, CTX and PCT in infected group before and after treatment, but no significant differences were revealed (Table 3). We also compared PTH, 25-(OH)VD, BALP, IL-6, CTX, OC, PCT and SNAPPE-Ⅱ among the neonates without infections before and after receiving effective treatment, but no significant changes were observed (Table 3). Data of infected neonates, including the measurements at the time of first blood sampling. Comparison of PCT, IL-6, PTH, 25-(OH)VD, OC, BALP, CTX and SNAPPE-II between non-infected group and infected group before and after effective treatments. §: compared with a and b, p<0.01; §§: compared with a and b, p<0.001. The difference values of BALP and IL-6 in infected neonates before and after treatment. Black points represent BALP and stars represent IL-6. BALP: bone alkaline phosphatase; IL-6: interleukin-6. 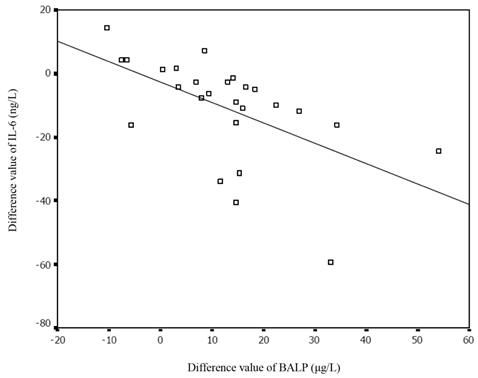 The correlation between the difference value of BALP and that of IL-6 before and after treatment. IL-6: interleukin-6; BALP: bone alkaline phosphatase. The aim of this work was to study whether the serum levels of bone metabolism biomarkers can be used to assess the severity of infected neonates. The main finding was that serum BALP, as a marker of bone formation, may be used as a marker to assess illness severity of infected neonates. As a specific marker of bone formation, the serum BALP level is affected by the number and activity of OBs. We found a depressed activity and an increased apoptotic number of OBs in septic mice (unpublished data), and another experiment in mice also exhibited a similar result . In this study, as expected, we found that serum BALP concentrations were lower in infected neonates than those in non-infected neonates. PTH and Vitamin D play essential role in regulating bone metabolism [26, 27], we measured serum levels of PTH and 25-(OH)VD, and found no significant changes between the neonates with and without infections, and the infected neonates before and after treatment. Our data indicated that, in this study, the changes of serum BALP concentrations were not related to PTH and Vitamin D activity. We also measured the serum levels of another bone marker, OC, in those neonates. It is known that OC is deposited in bone matrix after being produced by OBs, and is released into circulation during bone resorption. Thus, OC is, in fact, a marker for bone turnover, and changes in the activity of both OBs and OCLs can affect the blood concentrations of OC . Previous study demonstrates that N-MID of OC is more reliable than intact OC for evaluating bone turnover state . In this study, we measured N-MID of OC and found no significant changes in it between infected group and non-infected group. Similarly, an earlier study also showed unchanged levels of OC between the neonates with and without infection . Whether this result indicates that makers for bone formation are more sensitive than those bone turnover makers in assessing illness severity is currently unknown. Because SNAPPE-Ⅱ is clinically used to evaluate the physiologic changes and assess the illness severity of neonates , we explored the relationship between BALP and SNAPPE-Ⅱ in this study. Our results showed that SNAPPE-Ⅱ was higher in the infected group than it in the non-infected group. 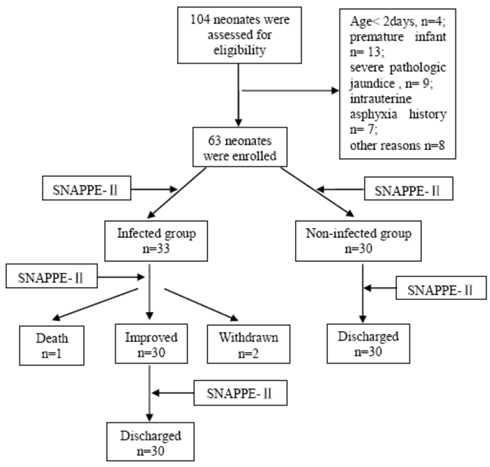 Among the infected neonates, SNAPPE-II was higher before receiving treatments than that after receiving treatments, the findings were similar to a previous study which reported that SNAPPE-II was an empirically-validated parameter for assessing illness severity . We found inverse correlations between BALP and SNAPPE-Ⅱ in infected neonates before or after effective treatment, which further suggests that BALP may be used to assess illness severity of neonates with infection. IL-6 is considered to be a valuable marker for assessing illness severity of patients with sepsis [30, 31]. In this study, we also analyzed the relationship between the BALP and IL-6 levels in infected and non-infected neonates, and in the infected neonates before and after receiving effective treatment. In infected neonates, we observed that the value difference in BALP level before and after the effective treatments was inversely correlated with that of IL-6, while no significant relationship between the BALP and IL-6 levels was found. Because IL-6 levels are correlated with clinical severity, the finding of the relationship between BALP and IL-6 levels further supports that BALP levels may reflect illness severity of the infected neonates. As the levels of serum BALP are dynamically changed in patients, a dynamic observation of BALP should be more accurate for assessing the severity of illness. Previous studies have shown increased OCLs activity in septic mice and premature infants with necrotizing enterocolitis [10, 23, 32, 33], but Cakir et al. found no significant difference in CTX between the neonates with some kinds of bacterial sepsis and with some diseases such as respiratory distress syndrome, congenital heart disease, pneumothorax or neonatal pneumonia. In this study, we also found no significant changes in CTX levels between the infected and non-infected groups. Because the levels of CTX can be affected by both inflammatory factors or non-inflammatory factors, we speculate that this may be the reason for the absence of changes in CTX level in our study. Additionally, infections caused by different pathogens may be another reason for the insignificant change of CTX. Based on our previous works, we also speculate that the increased apoptosis of OCLs in sepsis should not be ruled out (unpublished data). PCT is a promising diagnostic marker used recently to help the diagnosis of sepsis and is also an indicator of the severity of sepsis [34, 35], but false-negative cases have been found. A study showed that PCT is not sufficiently reliable to be the sole marker of sepsis . Other studies indicated that non-specific inflammation, such as respiratory distress syndrome and acute lung or inhalation injuries can also result in an increased serum PCT concentration in newborn infants [36, 37]. In this study, we found no significant changes in PCT between the infected and non-infected group, as well as infants before and after treatment. The synergic effects of infection and non-specific inflammation on the PCT synthesis may be one of the reasons for this result. Another likely explanation is that the inflammations of the infected neonates might be caused by different pathogens, this heterogeneity may cause various changes in PCT levels. Our study has some limitations. Because it's very difficult to obtain blood samples from healthy neonates for study purpose, we didn't have chance to compare the changes in bone biomarkers and inflammatory factors between healthy and infected neonates. Given the fact that the link between serum BALP and infection is established, it is possible that the association may also be caused by the random observation. Although this study suggests the role of bone biomarkers in assessing ill severity of infected neonates, further studies are needed to evaluate whether combination of serum BALP and other biomarkers such as IL-6 can improve the accuracy in assessing illness severity of neonatal infection. In summary, the BALP level, with its lack of significant circadian variation and convenience of measurement by an electrochemiluminescence immunoassay, can be potentially used to assess the illness severity of infected neonates. As far as we know this is the first report about the assessment of illness severity using bone metabolic biomarkers, and further studies are needed to confirm our results in larger groups of patients. We thank Fengtao Luo for his help in statistical analysis. This study was supported by the Special Funds for Major State Basic Research Program of China (973 Program, No. 2011CBP64701), Program for Changjiang Scholars and Innovative Team (No. IRT0712); Natural Science Foundation of China (No. 81030036, and No. 30530410).